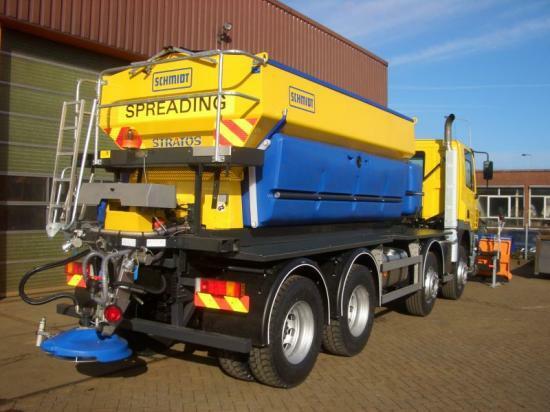 Scotland TranServ, winners of the �27m a year highways maintenance contract for North-West Scotland, has chosen Schmidt to supply salt spreaders, snowploughs, snow blowers and road verge grass cutting equipment in one of the largest single orders for British highways products. Whatever the weather, Scotland TranServ will be endeavouring to keep traffic moving throughout the North West Unit from Wick and John O'Groats through Skye, Fort William, Oban, Argyll, Perth and Loch Lomond. The area covers over 1300km of highways and 1300 structures, including the Skye bridge. Scotland TranServ 's client, the new Transport Scotland Agency of the Scottish Executive, has specified that the entire winter fleet must, for the 2006/7 season, spread pre-wet salt - not only a major breakthrough for technology that has been proved throughout Europe, but also a significant saving on use of salt. Pre-wet salt is also used successfully by the National Assembly Welsh Government as well as several local authorities. The order consists of over 30 nine cubic metre Schmidt STRATOS demountable spreaders on MAN 6x6 chassis and DAF 6x4 chassis. Four Combi speaders are permanently mounted on DAF 8 x 4 chassis and are equipped with a tank fitted in front of the spreader so that special acetate with a very low freezing point can be used to treat bridges. All vehicles are fitted with either Schmidt SNK polymer snowploughs or heavy-duty Schmidt Cirron steel snowploughs. Schmidt is also delivering six new Mercedes-Benz Unimog U500s, along with two smaller, demountable spreading units. The Unimogs will also carry powerful Schmidt snow cutter/blowers and steel snowploughs. In summer the fleet of Unimogs will use Schmidt Mulag mowers fitted to the front and rear, plus a forward verge mower and post strimmer, to mow highway verges. "North-West Scotland is a massive area to cover and experiences some of the most severe winter conditions in the UK. Major roads and trunk roads are long and can be quite narrow, often with steep gradients. They must be treated against ice and snow," says Paul Diver, Managing Director of Schmidt UK. "We are very pleased to supply our high quality spreaders, ploughs and de-mountable cutter blowers for this contract. It is wonderful that the Scottish Executive have chosen pre-wet salting, a well-established technology that has been proved all over Europe. This salting method is ideally suited to the winter conditions in Scotland, will be kind to the environment, and will save on the consumption of salt. It is also good to see the introduction of Unimog-mounted Mulag mowers to the summer operation, which will be very cost effective" he adds. One of four Schmidt Stratos Combi spreaders on DAF 8 x 4 chassis. Each has a tank fitted in front of the spreader so that special, very low freezing point acetate, can be used to treat bridges.